One hundred percent analogue - one hundred percent power. The Analogue Solutions Impulse Command brings to your synth collection the means to create pulsing bass lines like no other, exciting leads the likes you've never heard, and all the sequencing you'll ever need. A true analogue powerhouse, the Impulse Command features fully analogue audio and deep modulation circuits, stereo filters, stereo effects, as well as a 16 step analogue and a 16 step MIDI Note sequencer. 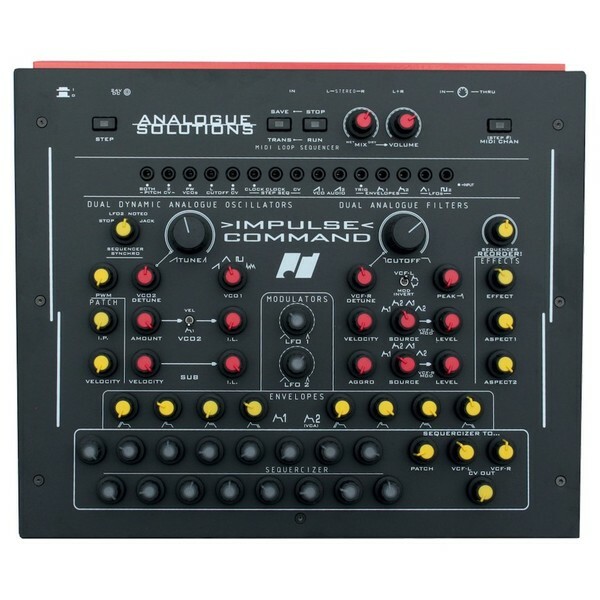 Impulse Command thrives as a centrepiece to your studio and stage synth set up. Drums, bass, leads, whatever you want. Impulse Command excels at them all. It's compact, neatly arranged, and is packaged with everything you'll ever need to bake up a batch of truly analogue sonic treats. Impulse Command is truely, one hundred percent, fully analogue. It's not just the filters or the voices. 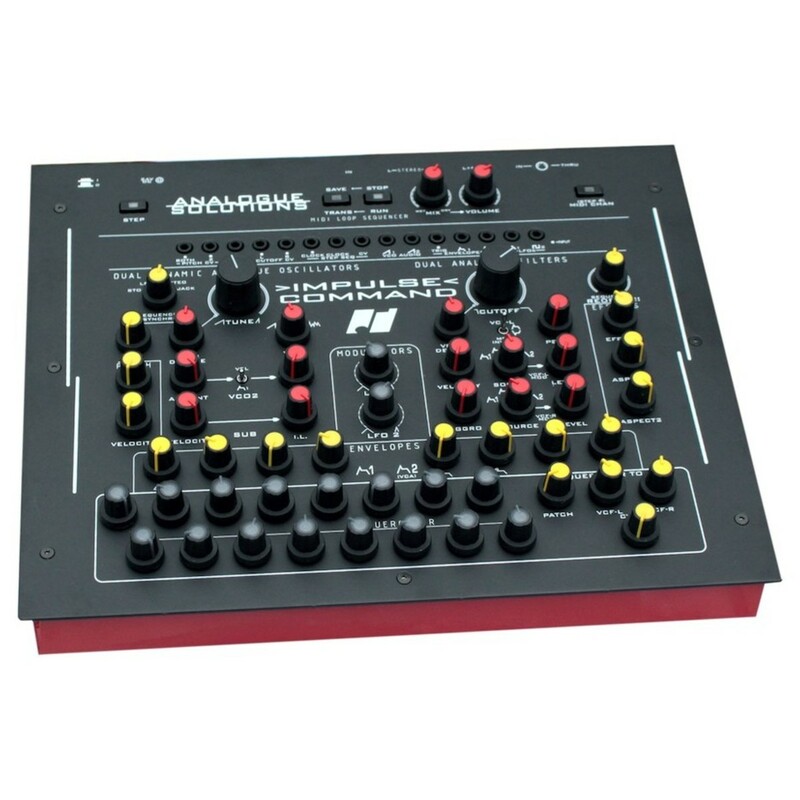 Everything, from the mixer to the sequencers are completely analogue. This gives the Impulse Command a sound like no other. It is ideal for generating a world of unique sounds and noises and acts as the perfect centrepiece of your synthesizer set up. It doesn't matter if you want to use Impulse Command to fill the low end with subby bass lines, bash out a rhythm as a versatile drum machine, or to add flurries of arpeggios. The Impulse Command excels at generating best-in-class sound. Fitted with two low pass filters, this synthesizer has the ability to produce stereo loops that sound like multiple synths playing at once. Analogue often doesn't sound big enough but fortunately, the Impulse Command with its effects and filters sounds massive. This machine produces sounds that immediately feel different. And is worlds apart from its peers. 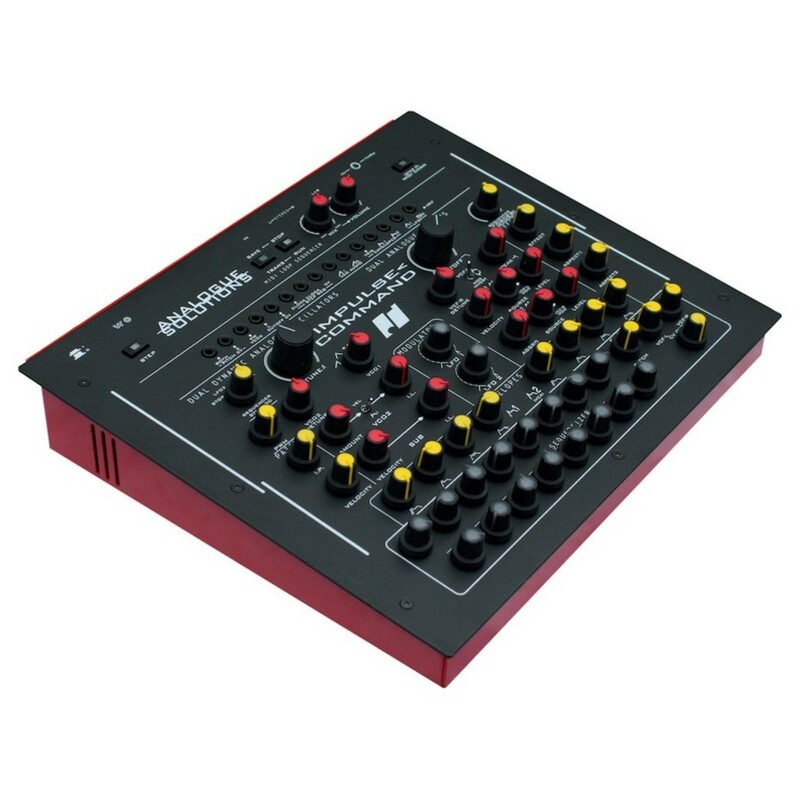 There are two sequences on the Impulse Command, one for controlling MIDI and the other is an analogue sequencer. Both 16 step. The special ability of these sequences is the ReOrder! function. This rearranges your sequences with a push of a button. Fear not though, this pseudo-random function is restrained just enough to keep things musically coherent. So it always sounds good, no matter how often you use it. Thanks to its semi-modular design, the Impulse Command is ready for you to enter a new world of synthesis. The dynamic patch system means you can create any sound you can imagine with just a few cables and some logical thinking. The patch system is intuitively laid out so it inspires and informs and helps you make the best decisions for your patches. Control pitch, VCO PW, left and right cutoff, and much more. Through sufficient patching, your sequences will evolve and sound interesting even during the longest performances. Please Note: This product is upcoming and certain specifications are not yet available.